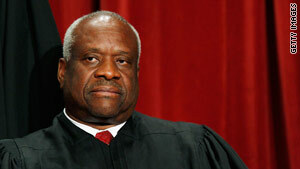 Justice Clarence Thomas, usually taciturn at Supreme Court arguments, showed his humorous side on Tuesday. Washington (CNN) -- Sometimes the most complicated of cases at the Supreme Court brings out the best arguments. It certainly brought out the giggles in a little-watched appeal Tuesday over federal prison terms. At issue was how the federal Bureau of Prisons should calculate "good-time credit" -- reduced sentences for inmates staying out of trouble in custody. Prisoners can earn up to 54 days of credit for each year of the sentence. The ambiguity comes with language in the federal law on how to add up the credits. Prisoners and even law enforcement officials find the formula complicated. The high court agreed Tuesday -- repeatedly. Justice Antonin Scalia suggested the good-time credits kick in at day 311 -- 54 days before year's end -- and not day 365. Jeffrey Wall, arguing for the government, replied, "Justice Scalia, I think that sets up an odd system,"
Scalia pointed his finger at Wall's adversary, a federal public defender sitting in the next table, who was nodding his head vigorously at Scalia's comments. "See, he agrees with me!" said the justice. Justice John Paul Stevens later expressed concern at the government's position. "If there are 195,000 people spending significantly more time in jail than they should, that's kind of troublesome"
Wall explained that is how prison officials have been doing it since 1987, and Congress never bothered to amend the good-time formula. "Probably they [lawmakers] didn't understand it because it's an awfully hard statute to understand." Wall jumped in. "Justice Stevens, with all due respect, Justice [Stephen] Breyer got it in the first five minutes." "Well, he's a lot smarter than I am," replied Stevens, smiling broadly. Scalia couldn't resist. "Even Justice Breyer has got it!" he roared. "Whoa!" The two jurists are ideological opposites, but good friends on and off the bench. Near the end, Justice Sonia Sotomayor had problems with her math. Under the current interpretation, the government does "the measurement [of good-time credit] at the end of the 365 days," she told Stephen Sady, lawyer for the inmates. "Let's say he misbehaves on the 340th day, and they say for that reason, we're only going to give you 10 days of credit. So now your year starts at 350?" "355. Yes," Sady corrected her, politely of course..
"No 350, because they are only giving 10 days of good-time credit." She paused for a second. "Because at the end of-- wait-- 355..."
"355," answered Sady, politely of course, but smiling. "That was pretty bad," said Sotomayor, hands raised, shaking her head and chuckling at her mistake. The courtroom erupted in laughter.